- During the day, under the influence of sunlight, algae use CO2 as a material for photosynthesis to produce oxygen (O2). - When there is no sunshine, but rain and during nighttime, algae use oxygen (O2) for respiration. - Those processes make the amount of dissolved oxygen (DO) in water fluctuate significantly. DO is high at noon and is low at down. - Algae indirectly affect the pH value of water. • Blue green algae: This group of algae is harmful to shrimp. Rakhoroni algae such as Microcystis sp. cause scum on water surface. It makes shrimp smell fishy or foul, discharges sticky mucus through cell membrane, and causes blockages in shrimp’s gills. • Dinoflagellate algae: There are many types of algae in this group conveying toxins, which can make shrimp die. • Diatom algae: Diatoms are feed of post-larval (E.g. : Chaetoceros sp., Skeletonema sp.). The life cycles of diatoms are relatively short. Thus, they easily cause changes in water color. • Green algae: This group of algae does not contain toxins and does not make shrimp smell. Green algae usually have small sizes and long life spans. They help stabilize the color of water in ponds. In this group, Chlorella sp. algae have the ability to prevent the growth of Vibrio bacteria. 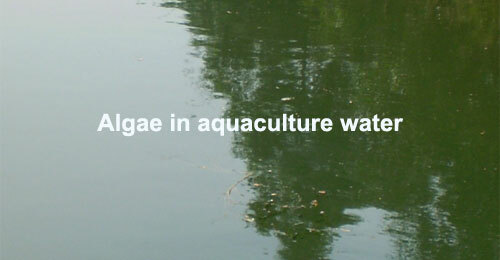 In sum, the amount of algae and types of algae in the water can greatly affect the color and turbidity of water in aquaculture ponds.